Spire today introduced the Fourier IV, the latest DIY Heat-Sink design to cool both the latest Intel and AMD micro-processors. 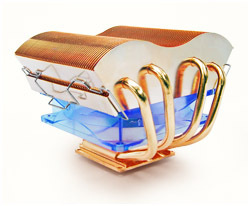 The Fourier IV is an all new processor cooler based on the Waved-Fin design, equipped with 4 Heat-Pipes." said Vincent Chan, Thermal Engineer for Spire. Also new on this advanced processor cooler are the swift fan exchange clips enabling you to remove the fan quickly and without tools. When utilizing a low power Celeron or Duo-Core micro processor with good system cooling using an active cooler is not mandatory as the Spire Fourier IV heat-sink offers exceptional passive cooling qualities on it's own. The Fourier IV is an excellent DIY option those for those who are upgrading their system, enthusiast and gamers alike.